The prayer touches the heart of everyone who reads it, and the graphic is beautiful and uplifting. Consider giving it out as a package with the booklet The Secret of Happiness. This design is also available as a postcard. How are you today? Often this common question will turn a conversation towards health. Our Healing teaching cards have the short healing prayer on the back. They are low-cost, easy to carry, and can be left at doctor's offices, hospital chapels, or given to friends and strangers. They are also available in Spanish. Including our new Comfort Booklet (BKT-221) on healing and our Three Tools of Healing poster/pamphlet (PP-3T), we now have six affordable give-away items about healing. Each serves a unique purpose. Packet of 50 Wallet sized "Afterlife Prayer Card" cards. The front says "After-life, from the Sacred Writings of the Baha'i Faith" The back says "Know thou of a truth tht the soul, after its separation from the body, will continue to progress until it attaineth the presence of God, . . . It will endure as long as the Kingdom of God, His sovereignty, His dominion and power will endure. It will manifest the signs of God and His attributes, and will reveal His loveing, kindness and bounty. The movement of My Pen is stilled when it attempteth to befittingly describe the loftiness and glory of so exalted a station. - Baha'u'llah" 3.5" x 2" This is a pack of 50 for $6. The design borrows from our Pocketful of Pearls children's prayer book. The sea background and shell border complement the phrase "These children are pearls, cause them to be nurtured within the shell of Thy loving-kindness." They are not proclamation tools, they are prayers, and this assortment includes the kind of prayers and quotations that you will want to share when you are having intimate discussions with your friends about the things that are on their mind. Packet of 50 double wallet sized "Prayer for Husbands" cards. Each one folds in half to become a wallet sized card. The front says "A prayer for Husbands" 3.5" x 2" This is a pack of 50 for $6. 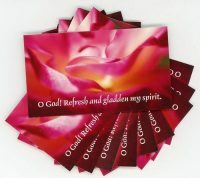 Packet of 50 Wallet sized "An Uplifting Thought - prayer card" cards. The front says "An Uplifting Thought from the Baha'i Sacred Writings" 3.5" x 2" This is a pack of 50 for $6. Packet of 50 Wallet sized "Blessing" cards. The front says "A Blessing" The back says "Blessed is the spot, and the house, and the place, and the city, and the heart, and the mountain, and the refuge, and the cave, and the valley, and the land, and the sea, and the island, and the meadow where mention of God hath been made, and His praise glorified. Baha'u'llah" 3.5" x 2" This is a pack of 50 for $6. Packet of 50 Wallet sized "Prayer for Guidance" cards. The front says " A Prayer for Guidance from the Writings of the Bahai Faith" 3.5" x 2" This is a pack of 50 for $6. Packet of 50 double wallet sized "Some teachings of the Baha'i Faith" cards. Each one folds in half to become a wallet sized card. The front says "Some teachings of the Baha'i Faith" 3.5" x 2" This is a pack of 50 for $6. 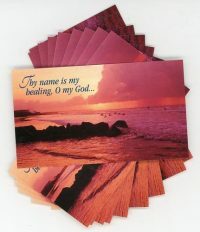 Packet of 50 Wallet sized "Thy heart is My home - prayer card" cards. The front says "O Son of Being! Thy heart is My home; sancify it for My descent. Thy spirit is My place of revelation; cleanse it for My manifestation. Baha'u'llah" The back says "I swear by My life! Nothing save that which profiteth them can befall My loved ones. To this testifieth the Pen of God, the Most Powerful, the All-glorious, the Best Beloved. Baha'u'llah" 3.5" x 2" This is a pack of 50 for $6. Packet of 50 Wallet sized "Prayer for Healing" cards. The front says "A Prayer for Healing from the Sacred Writing of the Baha'i Faith" The back says "Thy name is my healing, O my God, and remebrance of Thee is my remedy. Nearness to Thee is my hope, and love for Thee is my companion. Thy mercy to me is my healing and my succor in both this world and the world to come. Thou, verily, art the All-Bountiful, the All-Knowing, the All-Wise. Baha'u'llah" 3.5" x 2" This is a pack of 50 for $6. Packet of 50 Wallet sized "Prayer for Travelers" cards. The front says "A Prayer for Travelers from the Sacred Writings of the Baha'i Faith" 3.5" x 2" This is a pack of 50 for $6. Packet of 50 Wallet sized "Work is Worship" cards. The front says " Work is Worship from the Bahai Writings" The back says ". . . all effort and exertion put forth by man from the fullness of his heart is worship, if it is prompted by the highest motives and the will to do service to humanity. Abdu'l-Baha"
Packet of 50 Wallet sized "When you have blown it - prayer card" cards. The front says "When you feel you've really blown it . . . Some thoughts on God's Mercy' from the Sacred Writings of the Baha'i Faith" 3.5" x 2" This is a pack of 50 for $6.